The goals and purposes of this breed standard include: to furnish guidelines for breeders who wish to maintain the quality of their breed and to improve it; to advance this breed to a state of similarity throughout the world; and to act as a guide for judges. Breeders and judges have the responsibility to avoid any conditions or exaggerations that are detrimental to the health, welfare, essence and soundness of this breed, and must take the responsibility to see that these are not perpetuated. Any departure from the following should be considered a fault, and the seriousness with which the fault should be regarded should be in exact proportion to its degree and its effect upon the health and welfare of the dog and on the dogs ability to perform its traditional work. This original Epagneul Breton Breed Standard presented below is credited to the FCI (Federation Cynologique Internationale) online version of March 25, 2003 (from FCI St. No. 95, May 5, 2003). The French language version was translated to this English version for the FCI by John Miller and Raymond Triquet, France. The FCI English version became available online on September 14, 2004. The context of this standard is precisely the same as the English version from the FCI, with the exception that a very few words, punctuations, and measures were adjusted to the usual American form of the English language. The FCI version contains words in parenthesis. A few more words in parenthesis were added for explanatory reasons, and the categories are organized to appear in the customary UKC format. In addition to that, artwork and reference to the artwork, has been added to help visually illustrate the precise and proper physical characteristics of the Epagneul Breton that the breeders should select for. Artwork is also included to show some selected undesirable canine characteristics that breeders should select against. The use of the artwork is intended as an aid to help anyone better visualize and understand the precise positive (proper) or negative (improper) aspects of the body conformation of the Epagneul Breton dog. All of this artwork is used by permission from, and duly and totally credited to, Jean Louvet, France. Preface by French Brittany Gun Dog Association of America, Inc. Conformation Standard Committee and Board of Directors. The Epagneul Breton was recognized by the United Kennel Club in 2002. Brief Historical Summary. Of French origin and, more precisely, from the center of Brittany. At present, in first place numerically among French sporting breeds. Probably one of the oldest of the spaniel type dogs, improved at the beginning of the 20th century by diverse outcrosses and selections. A draft of a breed standard drawn up in Nantes in 1907 was presented and adopted at the first General Assembly held in Loudac (in former Cotes du Nord department, now Cotes dArmor), June 7, 1908. 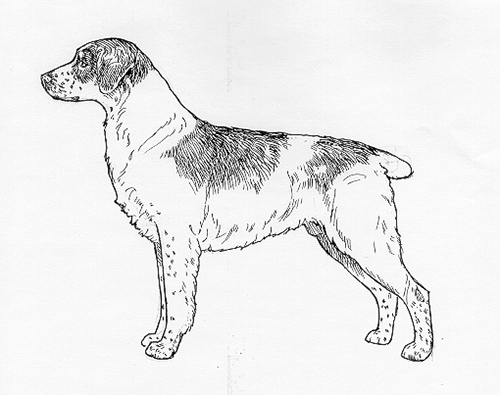 This was the first standard of the Naturally Short-Tailed Brittany Spaniel Club. Smallest of the pointing breeds. The Epagneul Breton (French Brittany) is a dog with a Continental spaniel-type head (braccode in French) and a short or non-existent tail. Built harmoniously on a solid, but not weighty, frame. The whole is compact and well-knit, without undue heaviness, while staying sufficiently elegant. The dog is vigorous, the look is bright, and the expression intelligent. The general aspect is cobby (brachymorphic), full of energy, having conserved in the course of its evolution the short-coupled model sought after and fixed by those having recreated the breed. The skull is longer than the muzzle, with a ratio of 3: 2. Head is in proportion to the body. The depth of the chest, from withers to brisket, is slightly less than half the height of the dog. Dog adapting itself to any environment, sociable, with an intelligent and attentive expression, mentally balanced. Versatile pointing dog, for any game on any terrain, precocious in revealing its hunting passion. Remarkable in its searching for game, its gaits, its scenting ability, its ranging in the field, its spontaneity and duration of pointing, its retrieving and its aptitude for training. Not loose, not very large, relatively thin and fitting tightly. The lower is discreetly masked by the upper, whose contour bends progressively until reaching the commisure (point where the upper and lower lip meet), which is not too apparent and tightly closed. The whole is free of depigmentation. Straight, with lateral surfaces practically parallel. Not heavy, the skin fitting tightly. Large, with very wide, humid (moist), and well-open nostrils, of a color in harmony with that of the coat, as is the case of the edges of the eyelids and natural orifices. Limbs well poised. Joints flexible and sturdy. Mobile, long (30% of the height at the withers), close to the body, with thick muscle. Its slope is that of a galloper, between 55 and 60 degrees from the horizontal. The tips of the shoulder blades are separated by 2 inches (5 cm). Heavy, thick and very muscular. It is slightly longer than the shoulder blade. The scapulo-humeral angle (between the shoulder blade and the arm) is between 115 and 120 degrees. Muscular and clean. Slightly longer than the arm. It should be practically perpendicular to the ground. Close to body. Neither in nor out. Solid while maintaining a certain flexibility, slightly oblique (between 15 and 20 degrees from the vertical). Level to the loins and the beginning of the croup. Sufficiently mobile and hardly protruding, without being loaded. Straight, short and rigid, well coupled. Very slightly slanting, broad and muscular. Let down to elbow level, broad with ribs well sprung but not barrel-chested. Sternum wide and scarcely rising towards the rear. The rearmost ribs long and supple. Limbs well poised and parallel when seen from behind. Important (prominent), with thick and bulging muscles. It should be slanted between 70 and 75 degrees from the horizontal. Very slightly longer than the thigh, with clean, bulging muscles. Broad in the upper part, diminishing gradually in size towards its junction with the hock. The angle between the upper thigh and lower thigh is close to 130 degrees. Solid, nearly vertical when seen from the side. The coat is fine, but not silky, lying flat on the body or with a hint of a wave. Never curly. Short on the head and the front of the limbs. The hind part of the latter has a heavier coat, furnished with abundant feathering, diminishing along their length down to the carpus (wrist) or the tarsus (hock), or even lower. A self-colored coat is not allowed. White and orange, white and black, white and liver, with more or less extensive irregular white patches. Piebald or roan, sometimes with ticking on the top and sides of the muzzle or the limbs. Equally, in the case of tricolor coats, with tan spotting (orange to dark tan) on the top and sides of the muzzle, over the eyes, on the limbs, on the chest and under the base of the tail. A narrow blaze is desirable with any color of coat. Height is measured at the withers. Ideal height - 19.3 to 19.7 inches (49 to 50 cm). Minimum - 18.9 inches (48 cm), with a tolerance of .4 inches (1 cm). Maximum - 20.1 inches (51 cm), with a tolerance of .4 inches (1 cm). Ideal height - 18.9 inches to 19.3 inches (48 to 49 cm). Minimum - 18.5 inches (47 cm) with a tolerance of .4 inches (1 cm). Maximum - 19.7 inches (50 cm), with a tolerance of .4 inches (1 cm). The different gaits are easy, but powerful, even and lively. The legs move straight without exaggerated bouncing of the body and without rolling, the top line staying level. The canter is the most common gait in the field, the strides are rapid and of medium length, the hind legs having little extension to the rear (collected canter). Any departure from the foregoing points should be considered a fault, and the seriousness with which the fault should be regarded should be in exact proportion to its degree. Head planes: Somewhat divergent. (See Appendix Diagrams 3, 4, and 5.). Nose: Very slightly depigmented; interior of the nostrils depigmented. Jaws/Teeth: Pincer bite, teeth out of line. (See Appendix Diagrams 5, 8 and 9). Lips: Heavy, pendulous, upper lip covering the lower either insufficiently or excessively. Eyes: Prominent, round, or almond shaped. Back: Arched or saddle back. Croup: Too narrow, or falling away too sharply. Abdomen: Bulky, or too tucked up (whippety). Neck: Heavy and lacking reach. Throatiness. Flank: Too hollow, often accompanied by a weak loin lacking breadth. Limbs: Insufficient bone. Out at the elbows, pigeon toed, slew feet. Coat: Not heavy enough on the body. Eyes: Light, mean look, hawk-like expression. Neck: Excessively long, distinct dewlap. Any fault in temperament such as snapping, aggressiveness towards dog or man, excessive shyness. Lack of type: Insufficient breed characteristics, which means the animal on the whole doesnt resemble other samples of the breed. Height: Outside the limits defined by the standard. Abnormal markings: White spot on the ear or eye in a white patch. Pigmentation: Distinct unpigmented areas on the nose or eyelids. Presence of dewclaws (on the rear legs), even if rudimentary. N.B (Please note) Male Animals should have two apparently normal testicles fully descended into the scrotum. In UKC Conformation Shows, this breed is shown by variety in this order: Orange and White, All Other Colors. The docking of tails and cropping of ears in America is legal and remains a personal choice. However, as an international registry, the United Kennel Club is aware that the practices of cropping and docking have been forbidden in some countries. In light of these developments, the United Kennel Club feels that no dog in any UKC event, including conformation, shall be penalized for a full tail or natural ears. For more information on this breed, please visit the Club de l'Epagneul Breton of the United States, Inc.
Find a dog that will fit your family. Note: The breeders on this list are not endorsed by UKC. We are currently processing registration applications that were received as of April 22, 2019.